Some people are natural-born phrase twisters. The rest of us will likely need some help. Remember: Nobody ever said creative material had to spring from our heads fully formed — most of us have to work at it. 1. Identify your topic word. What’s the key word in your story? That good feeling puts readers in an agreeable mood and may even open their minds to your message. In fact, one study found that ads using rhetorical techniques were 166% more likely to persuade readers and 229% more likely to be remembered than ads that did not. The good news is that wordplay doesn’t take talent. It doesn’t take creativity. Instead, it takes techniques, tricks and time. At Master the Art of the Storyteller — our two-day creative-writing master class on Feb. 23-24 in Los Angeles, and on Sept. 25-26 in New York — you’ll get the tips and tricks you need to surprise and delight your readers with wordplay. Go beyond twist of phrase: Learn to flip phrases; compress details; sub soundalikes; list, rhyme and twist — even coin new words. Find online tools that do most of the work for you: Walk away with links to some of the best (free!) wordplay resources — as well as ideas for how to use them. Get inspired by some of the world’s most creative headlines. Stop writing groaners: Learn techniques that let you come up with surprising lines — and leave the clichés to the hacks. This is the only writing workshop we have planned in Los Angeles in 2017. 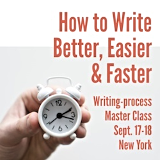 Don’t miss out on your chance to master creative-writing in LA! Register now.